Indonesia is having not only one culture but a mix of regional and ethical cultures! For foreigners working & living in Indonesia it is essential to learn about the cultural differences when dealing with Indonesians. Our training & workshops help you to better understand your local business partners, team members, colleagues or simply to make it easier for you to communicate and interact in daily life. 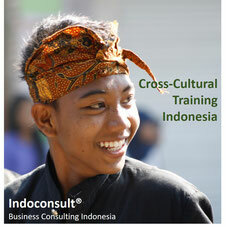 The wide range of cross-cultural training is designed to give you the necessary know how from your first arrival and beyond....to become a true cross-cultural expert on Indonesia! Are you going to work in Indonesia, travel there for business or take over an assignment with Indonesia? Our online courses will give you a quick but comprehensive overview of the cross-cultural basics when working in and with Indonesia. All courses are interactive webinars with experienced tutors. First time in Indonesia and the culture is overwhelming you? Do you find it difficult to understand certain behaviors or to communicate with Indonesians? Or do you simply want to know about the do's & don'ts when interacting with Indonesian business partners, colleagues or team members? If one of your answers is "yes" you should definitely join this training and learn about Indonesian culture. At our special workshop for expats in Jakarta you will learn about the basics of cross-cultural communication with Indonesian business partners, employees and clients. The workshop gives you insights into how to effectively communication and interact with Indonesians and how to improve your leadership skills in Indonesia. Management and Leadership in Indonesia follows some different patterns and a local management approach is necessary to reach your targets. In this workshop you will learn about the basics of leadership in Indonesia, how to motivate your team and what are the pitfalls for executives when working in Indonesia. We offer all our workshops and training as in-house events for your company with special conditions and customized content. A good deal if you have more than 3 participants and want to have a tailor-made training for your expat employees or their families. Contact our training team for an individual quotation!